Peterborough United have spent close to £650k on loan players this season with striker Jason Cummings’ six-month stay at the ABAX Stadium costing over £250k. Cummings was borrowed from Championship side Nottingham Forest, but scored just six League One goals, all of them in August. He is now on loan at League One leaders Luton Town. Posh chairman Darragh MacAnthony made the revelation during a q and a session on social media with the club’s fans this evening (March 20). Understandably it’s a situation the chairman is keen to avoid next season. MacAnthony also revealed there is a Posh player currently earning in excess of £5k a week. “We’ve spent a fortune on loan players,” MacAnthony stated. “It’s not just the wages. There are loan fees and clauses covering fees if they don’t play. We’ve had four loan players in the side at times this season and I don’t like that. You lose your identity as a club as a result. 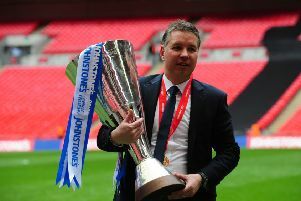 MacAnthony covered the reasons for re-appointing Darren Ferguson and for sacking his predecessor Steve Evans, all of which have appeared in the Peterborough Telegraph. He claimed Ferguson has ‘greatness’ as a manager within himself and backed Evans to win promotions at other clubs in the future. *Kyle Barker has joined Harrison Burrows as youth team players to have signed a professional contract. *Posh will again target young and hungry new players in the summer. *A couple of non-league ‘gems’ have been targeted and character tests are currently been carried out. *Posh will also try and sign some leaders aged 29-32. *Posh could sign up to 10 players in the summer. *Posh will have 17 current players still under contract in June, fewer than in most recent seasons. *Centre-back Ryan Tafazolli is out of contract at the end of the season and will leave the club. *Posh have an option to extend Marcus Maddison’s contract into next season. It will be Ferguson’s decision, but MacAnthony expects the player to stay. *Lincoln City have an option to sign Mark O’Hara in the summer, but other clubs are interested. *Posh will receive a six figure sum from Lincoln when the Imps win promotion from League Two this season. This relates to clauses in the contracts of former Posh players. *Next season will not be a ‘transition’ season. Promotion will still be the aim. *The chairman was ready to accept defeat this season as he thought the players had ‘gone’, but Ferguson didn’t agree and believes he can still get Posh into the play-offs. *Sacked Posh player Josh Yorwerth cost the club £300k in transfer fee and wages. MacAnthony insists recruitment must be better this summer. 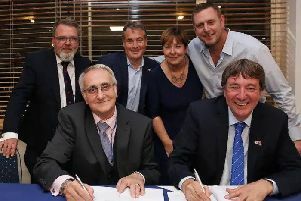 *Season ticket sales for 2019-20 so far were described as ‘phenomenal’ by the chairman.